Mozart for the Clarinet (Clarinet and Piano). Composed by Wolfgang Amadeus Mozart (1756-1791). For Clarinet, Piano (Clarinet). Woodwind Solo. Classical Period. Difficulty: medium to medium-difficult to difficult. Clarinet solo book. Standard notation, piano accompaniment and introductory text. 55 pages. G. Schirmer #ED2689. Published by G. Schirmer (HL.50330990).With standard notation, piano accompaniment and introductory text. Classical Period. 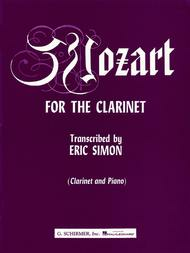 9x12 inches.Mozart contributed as no other composer to the clarinet literature, but there exists no original work of his for clarient and piano. Eric Simon has therefore transcribed the pieces in this collection to show the student the wealth of styles and musical media that Mozart covered. It has been designed for the development of taste and phrasing. The selections in the the beginning of this volume can be played by the beginner while the last ones are technically more advanced and may well figure in a recital program.